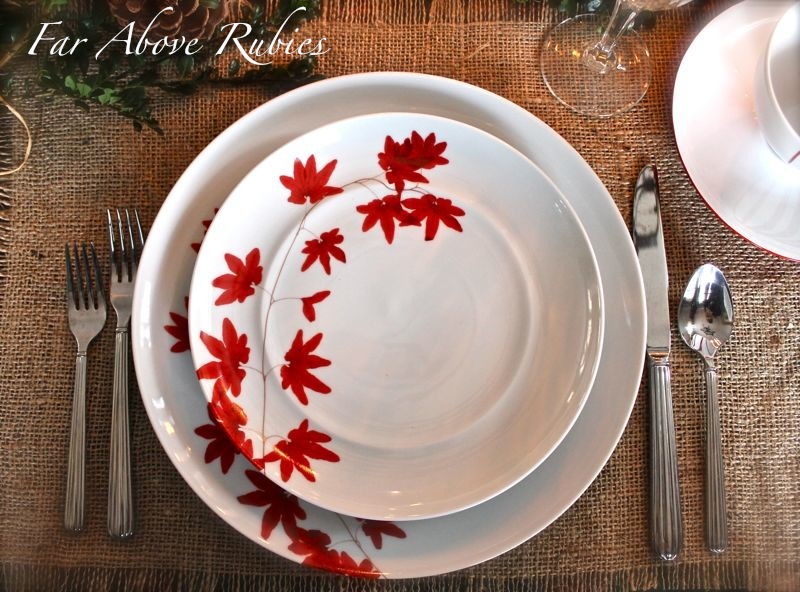 Far Above Rubies: Red for Thanksgiving and a giveaway! A couple years ago I received an email from someone at Lifetime Brands asking if I would be interested in hosting a giveaway for Mikasa. After getting up off the floor and recovering from shock, I went to work on my first giveaway of the Brava Rooster pattern. You see, I am not one of those bloggers with thousands of followers and companies and magazine editors filling up my inbox with offers. Even today, after three years of blogging, I'm still fall in the newbie/baby blogger category. So you can see why I was shocked. I was honored they would choose me to host a giveaway. The lovely people at Lifetime Brands have been just fabulous to work along side of the past couple years giving me the opportunity to host several incredible giveaways, so I wanted to celebrate my three-year-bloggiversary, which was actually October 1, with three, yes three Mikasa giveaways! So, to thank all of my faithful followers and friends for sticking with me, I will be offering some lucky winner 6 place settings of Mikasa "Pure Red!" 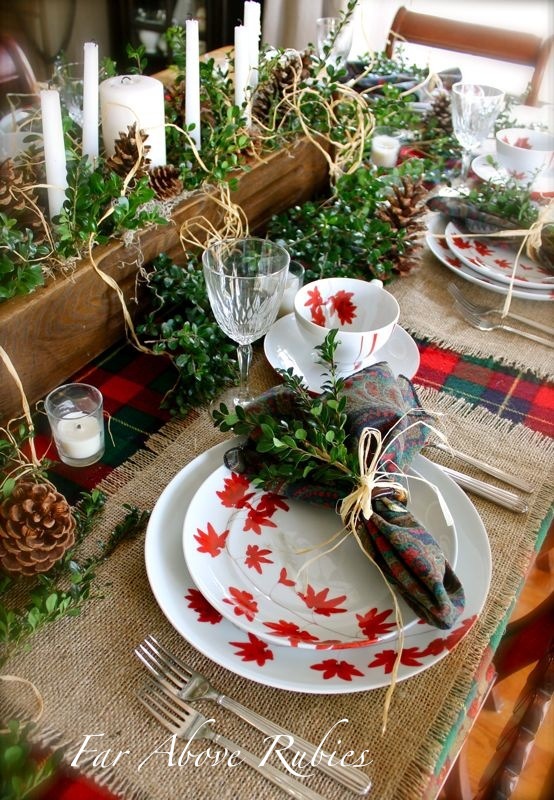 With the beautiful red maple leaf, this would be so nice for Thanksgiving, and even Christmas. I used a Ralph Lauren plaid throw, burlap placemats, paisley napkins, pine cones, raffia and lots of boxwood to keep things natural. The flatware is Mikasa "Italian Countryside" and goes so nicely with this dinnerware pattern. 1. 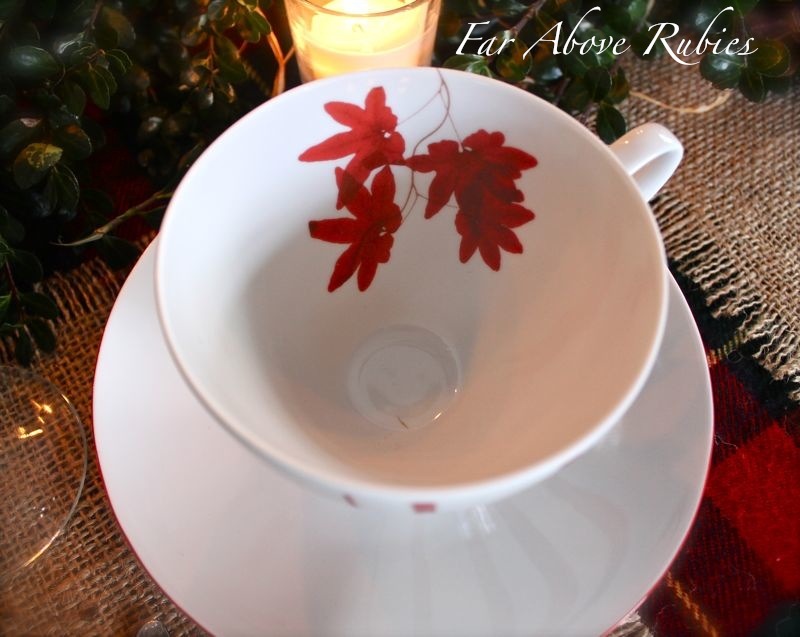 Follow Far Above Rubies on blogger for one entry. 2. "Like" Mikasa on Facebook for one entry. 3. "Like" Far Above Rubies on Facebook for one entry. 4. Blog about the giveaway, or post it on your sidebar or facebook page for one entry. Please stop back by here and let me which of the above things you have done so I can enter you in the drawing. You can leave one comment letting me know which of the above you do. The deadline for entries is Thursday, November 8 at midnight EST so don't wait! Thank you all so very much for stopping by here, leaving such wonderful comments, and for sticking around as I share our life in the country. A winner will be selected randomly from all the entrants. The Mikasa Pure Red was provided by Lifetime Brands, and the opinions expressed here are entirely my own. Very beautiful....I love the plaid with the burlap! 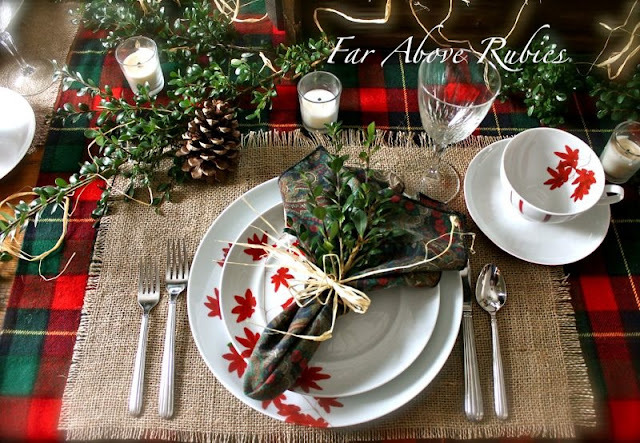 Anita, I always love the rustic, elegant style,the plaid, burlap and beautiful red splashed dinnerware, you did a beautiful holiday setting...the crystal stemware so pretty too. I will share, post right now on my FB. We have been so blessed in South Jersey,.. 50 miles from Atlantic City, shore... we lost power, food and scary times...,but OK ,tired, feel so badly for all others, prayers. I have been reading your blog for a long time and absolutely love it. I thought I was already a follower, but if not I am now. Your newest follower. Please enter me in this wonderful giveaway. Those dishes are gorgeous and so is your beautiful tablescape. Thank you. I liked Mikasa and of course, I love Far Above Rubies on FB! Love the pure red. It is perfect for Christmas and goes beautifully with the burlap. Congrats on your blogging anniversary!! Congrats on your anniversary, Anita! What a great giveaway...the pattern is beautiful. And as always, you have set an amazing table with it! I am a happy follower and would love the chance to win! I "liked" Mikasa on Facebook, as well! I'm already a follower! 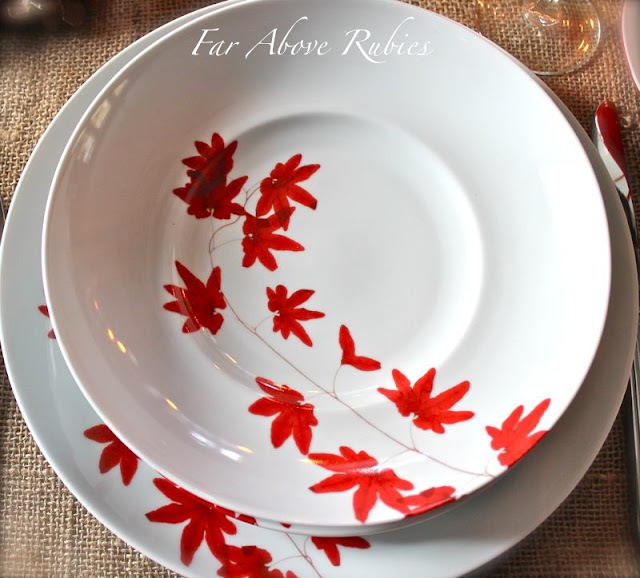 The dishes are lovely, I love the way the red leaves travel up the side of the plate. Very pretty table setting! How absolutely stunning it is. :-) I am already a follower on FB and blog ( google friend connect) . My eyes popped when I saw those dishes.. my heart palpitated. You KNOW my addiction, I mean passion for dishes. They are beautiful! The way you married the delicate dishes with the rusticity of the burlap and blanket id wonderful. Congratulations on your 3rd anniversary. The Mikasa Pure Red is gorgeous. I can just see it on our table right there in WNC... although we hit the road to Florida when we heard the snow as headed that way. I follow Far Above Rubies and love seeing and hearing about your country home. I also liked Mikasa on Facebook. Congrats on you blog anniversary. I just adore it. I am a follower of your blog. Congratulations on your bloggerversary! I am now a follower of your blog and facebook! Love the giveaway. Congratulations on three years of blogging! Your table scape is beautiful ~ I love all the natural elements. I already follow your blog and FB, so I "liked" Mikasa's page. This china pattern is wonderful and would fit right in my home. What a gorgeous tablescape! love the plaid and burlap! I met all the requirements for the giveaway! Thank You! Anita your tablescapes belong in a magazine!! Gorgeous as always!! LOve this table... so rich and full of beautiful details. I am a happy and faithful followers! I have followed Mikasa for a long time on FB! I liked you on FB. Thanks for the give away! Hi Anita, I guess we are supposed to comment for each option. So, 1-I do follow you on Blogger. Happily!!! 4- I posted this on Facebook too!!!!!!!!!! I'm sorry, I left too many comments: I did all 4 things, Anita! XO, Pinky Just delete the other comments or I will come back and do that. Anita, congrats on your three years! I started following you when you posted about your amazing kitchen, but I haven't read your about page until tonight. You have had some amazing life experiences! I have already liked Mikasa on FB and you as well. I used to live near a large Mikasa distribution center and would often go to their outlet store. Got some amazing deals there. 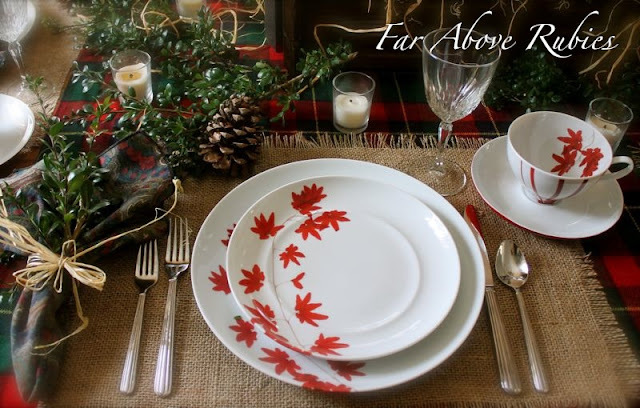 I love this new pattern and you have shown how gorgeous it is with your tablescape. I will put your giveaway on my sidebar. I am new to your blog, sent here by my older sister who has great taste. And I love the Mikasa pattern Pure Red. I love your blog! I live in a 112-year-old log cabin in Montana and also love your table runners and other beautiful vintage-looking pieces. I have been a follower, liked you on Facebook awhile back, and today liked Mikasa on Facebook. Please enter me in your giveaway. I looooove dishes! 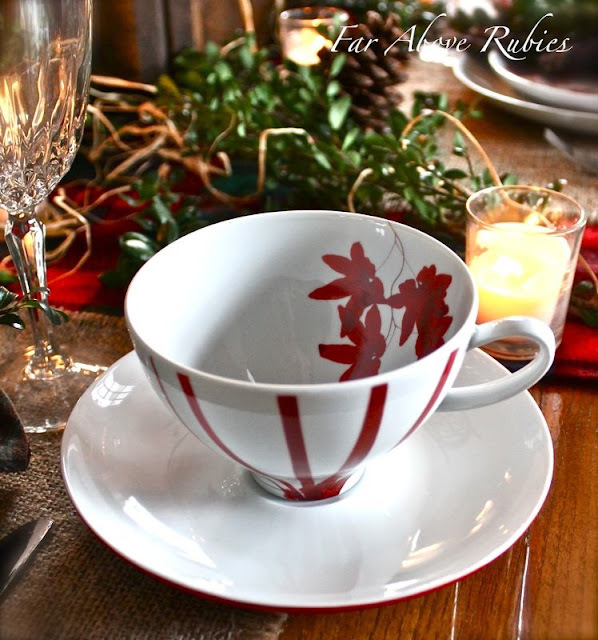 The Pure Red Mikasa dinnerware is just beautiful, and your tablescape is stunning. I would love to have a set! I am a quilter and would dress the table with quilted placemats and a table runner. I have been a follower of your blog for awhile, am following you on Facebook and also following Mikasa. Congratulations on 3 years of blogging. i "liked your facebook page! this blog is awesome. i just found it! Hi there! I 'LIKED' Mikasa on Facebook! I have 'LIKED' Mikasa' om Facebook!~Jody by the way, I LOVE your blog! I "liked" Mikasa on FB. Oh, Anita, red is always welcome at Christmastime, no matter how much we like pink! :) Love, love, LOVE your tablescapes!!!! I "liked" Mikasa on FB. Also "liked" FAR ABOVE RUBIES! 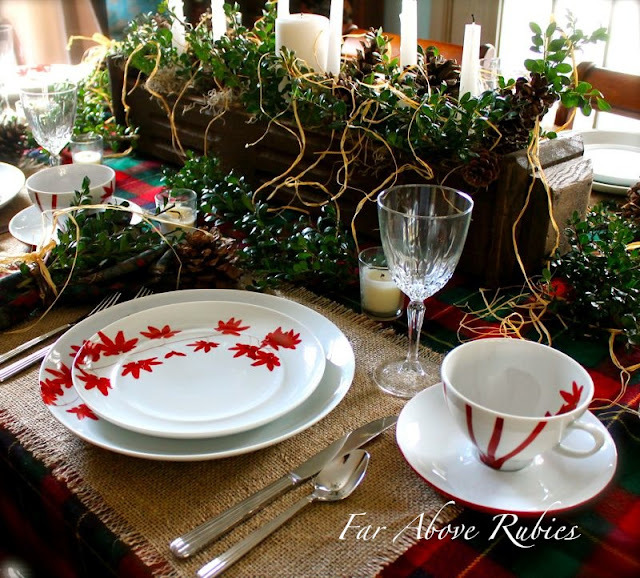 Love, love, love your TABLESCAPES!!! Beautiful dinnerware! Thank you for the giveaway. I followed Far Above Rubies on Facebook. Great giveaway Anita! I have done all of the above! Would love to win that gorgeous pattern. I have done all 4 things! I just love your blog; so many beautiful images and I'm STILL looking for the Brava Rooster pieces...one by one, LOL! I'm a happy follower of yours, I did put you on my facebook page with your Beautiful give-a-way comment. I would love to win this for a new Tablescape also..
Hello Anita, you tablescape is so pretty. I love the rich colors. Mikasa some gorgeous patterns. I have been a follower for quite some time. Thanks you for the opportunity. I have also liked Mikasa on Facebook and yourself. Your blog is beautiful! Here's looking forward to more blogiversaries to come. I liked both you and Mikasa on FB. Thanks for the chance to win! I have liked you on facebook for a long time and would follow your blog if I could, Atom just doesn't work with my wordpress. I also liked Mikasa & Pure Red on facebook, put the giveaway on my facebook with a note that when I got married in 1976 Mikasa, Just Flowers,since discontinued, was my china pattern! Good goods. Forgot to post comment, Liked, Mikasa,saw a post in news feed Anita about your blog!!! Posted on my FB wall and shared about your giveaway, on date of announcement, snowing here Anita! I gladly follow your blog. Please enter me in the give away. I "liked" you on FB! I popped over here from Wow Us Wednesdays and was glad to see you were having a giveaway! Fingers crossed. . .
Hi Anita! I just finished correcting papers and thought to stop and visit on Facebook. Please enter me in for this GORGEOUS dinnerware! I'm back to add a comment that I'm friends with Far Above Rubies on Facebook! And a last one for being friends with Mikasa on FB too!